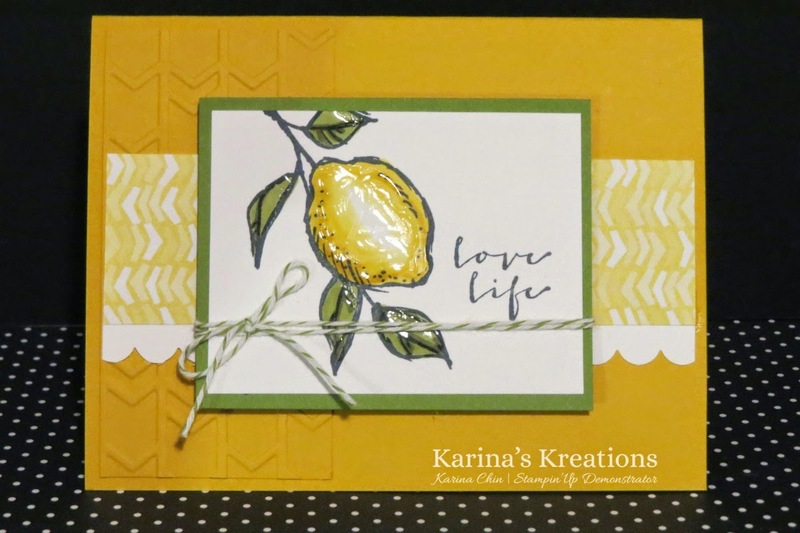 Karina's Kreations: A Happy Thing Sale-a-bration Card! A Happy Thing Sale-a-bration Card! What do you think of my swap card? I used the Happy Thing Sale-a-bration Stamp set and Best Year Ever Sale-a-bration Designer Series Paper. You can get these items free with a $60.00 order. Can you see how shiny the lemon is? I used Crystal Effects on the Lemon and the Leaves. It's a dimensional glaze that takes awhile to dry but adds a Wow effect to the card. Here's the other supplies for the card.